The value of a flight simulation largely depends on accuracy and realism. Of course, not everybody is training to become an ace pilot. Some people just want to have a fun time. But in either case, there’s no beating the immersive nature of authentic flight controls. The components used by the Alpha Flight Controls were designed for sims approved by the FAA. 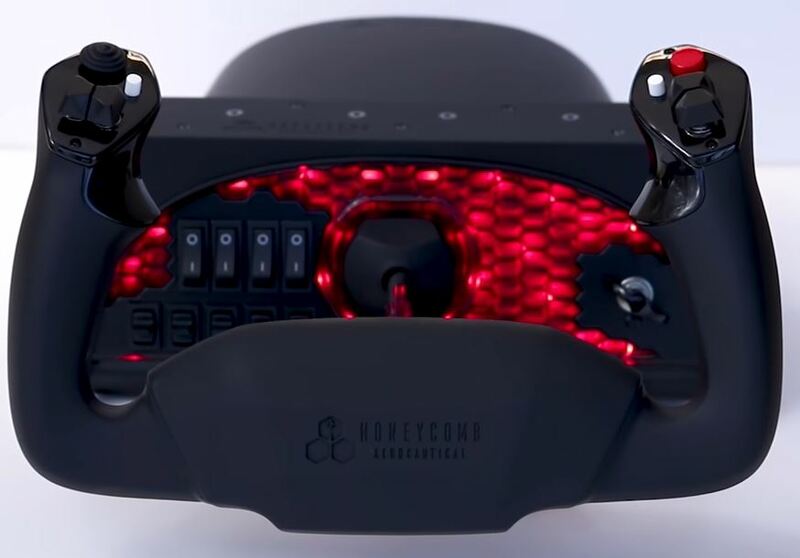 Because Honeycomb designed their flight control console using aviation style mechanisms, they’re able to make those familiar parts accessible for flight simulation. More than that, these parts mimic the weight and feel of an actual aircraft because they’re using essentially the same physical components. Honeycomb products were tested to be compatible with FlightSim X, Prepar3D, and X-plane 11. Additionally, Honeycomb includes driver support for both PC and Mac systems. Though the Alpha Flight Controls were designed to be effective as a standalone unit, all the Honeycomb products are capable of being used as part of a greater ecosystem of mods. It’s possible to use them separately, or combine them together into one fully realized cockpit. To the untrained eye, Alpha Flight Controls probably looks like any other flight mod on the market. From a purely aesthetic perspective, it physically resembles almost any entry-level game control device. That’s because while most of this device is composed of metallic parts, there are portions of the chassis which are made from ABS plastic. That’s mostly a good thing. It’s the kind of material used on most game controllers because it’s great at dissipating heat. It’s also cost effective, and good at absorbing shock. The only drawback is really visual. Though ABS starts out looking nice, it gradually develops a smooth and greasy texture. It also develops a distinctive polished look because human skin will gradually polish down the plastic. 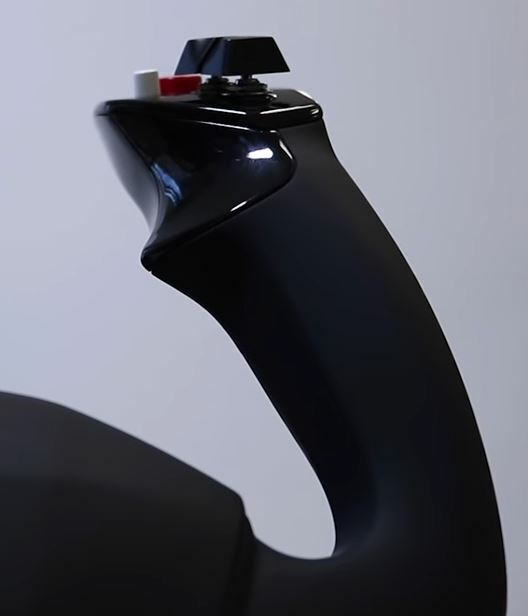 With these flight controls, the polishing effect of ABS will quickly take hold where your wrists come into contact with the flight controller. After about 18-months of steady use, you’ll be able to see visual wear on the device. But visual wear aside, the hardware is actually built to last. At its core is a sound mechanical design that’s built around a sturdy metallic frame. The base of the unit is weighed enough to remain firmly in place without the assistance of additional mounting, though those kind of options are available, as we’ll discuss later. For tabletop or desktop installations, casual users will find the Alpha Flight Controls suitably sturdy. 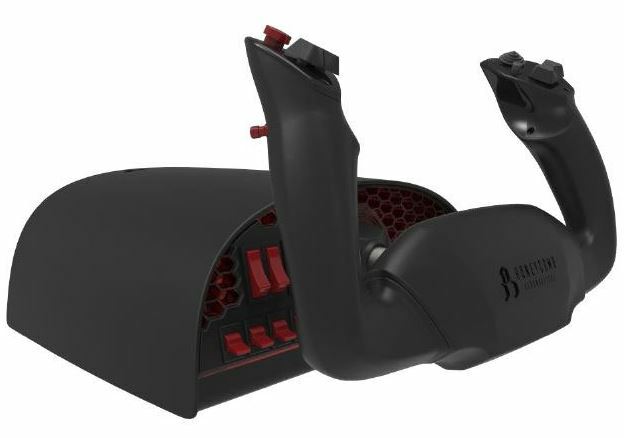 The yoke on the flight control is constructed with aerospace grade components, intended to provide true-to-life ergonomic feedback. Additionally, the yoke is capable of twisting a full 180°, side to side. Connecting the flight wheel to the rest of the console is a 6” steel shaft. Here we find all-metal parts, which is great because this portion of the Alpha Flight Controls involve mechanical movement. In the interests of durability, no other materials would be suitable. The steel shaft pulls out and retracts as necessary, which serves both the interests of portability, storage, and active use. The yoke’s radius has been dampened with the assistance of a self-centering mechanism, so it always pulls back to center. You can feel it the moment you get your hands on the controls. The feedback feels like a natural set of flight controls instead of some kind of arcade game controller. The left handle offers two buttons, a pair of two-way hat switches, and an additional push to talk button. Turning towards the right handle, you’ll notice another pair of switches. That includes one 2-way and one 8-way switch, and another set of buttons. For people familiar with this kind of equipment, none of this should be terribly surprising. Each button sinks in deeply when its pressed, the feedback is firm and responsive. Compared to some equipment, the Alpha Flight Controls could be considered to have a limited selection of control buttons. These days, it’s possible to find flight mods with almost a dozen different buttons on each stick. But sometimes authenticity trumps other concerns. If you’re looking to use FlightSim X, X-plane 11, or a similarly dominant flight sim platform, then you’re probably going to want a layout similar to the Alpha Flight Controls. Being able to customize your equipment on the software side is just as important as having authentic hardware. Whether or not you’re concerned about placing authenticity first, it’s nice to have all your options open. That way, it’s possible to transform the Alpha Flight Controls into a configuration that more closely mirrors different types of aircraft. Honeycomb’s control software provides you with the ability to create different user profile, so it’s possible to establish different profile settings for various aircraft. You can move from game-to-game or craft-to-craft and keep your settings. But Honeycomb’s control software is somewhat minimalistic. The depth of your control options are a tiny bit limiting because Honeycomb expects most of these types of adjustments to be made by whatever fight sim software suite you’re operating. 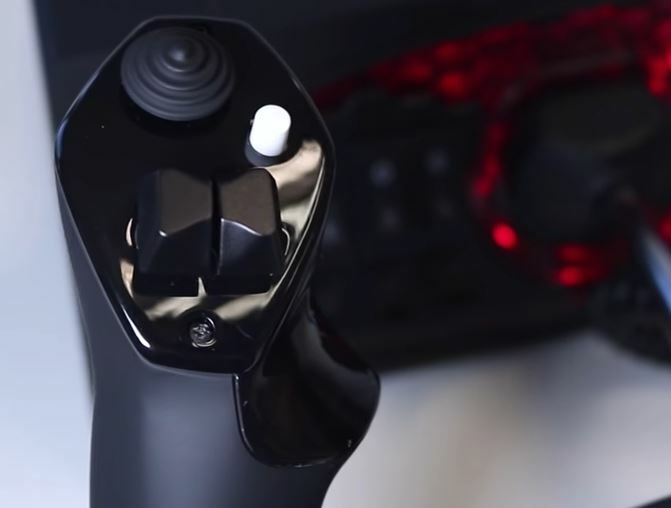 In most cases, your control options are really better characterized by the simulation you’re playing instead of the flight controls you’re using. The interface for the software itself is unattractive and not terribly intuitive at first. After you’ve taken a couple of minutes to get used to it, you should be able to get through setup without much trouble. More importantly, once you have a couple of profiles setup, you probably won’t have to trouble yourself with their control software again for some time. It would’ve been nice of Honeycomb’s controls had wider app support. But outside of their basic PC and Mac control software, there aren’t many alternative options for connecting. These flight controls can be used in a modular manner with other Honeycomb products, but individually it cannot be modularly adjusted to any serious degree. On the base of the console, it’s hard to miss the onboard switch panel. Here you’ll find avionics, light, alternator, and master switches. 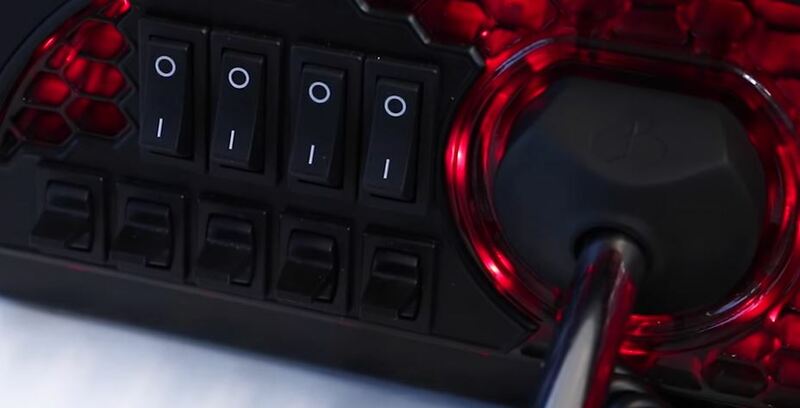 Behind the switchboard, there’s a stylish red LED backlighting, which brightens the backside of the control panel. Similar to a backlit keyboard, these LEDs aren’t only about style. They’re useful for brightening the control board while you’re operating in darkened conditions. And like keyboard LEDs, you’ll find these can also be turned off. Should they prove to be disturbing, it only takes about two seconds to make them go away. The Alpha Flight Controls include their own mounting bracket. 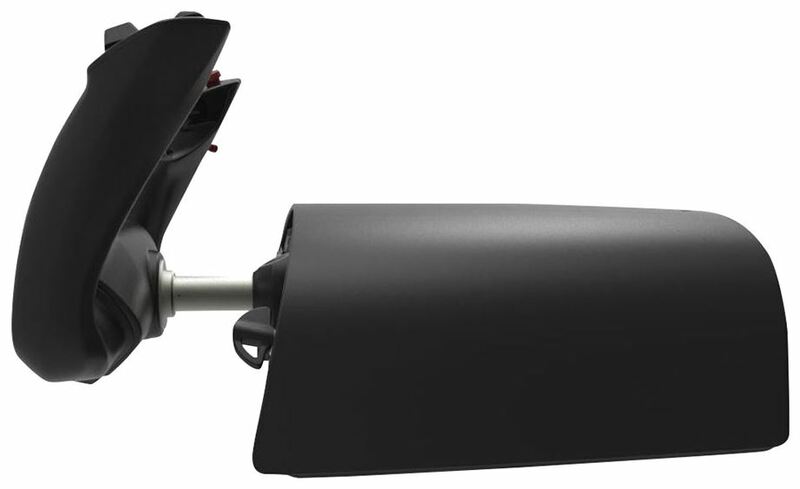 The bracket is compatible with Honeycomb’s broader ecosystem of products, and it’s also compatible with Saitek products. Whether or not you’ll end up needing the bracket depends on how elaborate your own setup happens to be. It does provide you with everything necessary to keep the Alpha Flight Controls locked in position. But you do need your own screwdriver or drill. If you plan on going with an installation that isn’t as permanent, then you’ll probably find the weight of the controls themselves are generally sufficient to keep them in place. Though when you don’t actually mount the controls to a larger object, the entire console feels slightly less stable to touch. When you’re dealing with top-shelf flight mods, it’s often possible to make detailed adjustments with respect to the physical feedback of the device. For instance, you might make flight sticks a little firmer or looser. Unfortunately, the Alpha Flight Controls do not provide any kind of detailed hardware adjustability. These are closer to mid-range flight controls, so they don’t have those kind of upper-tier features. 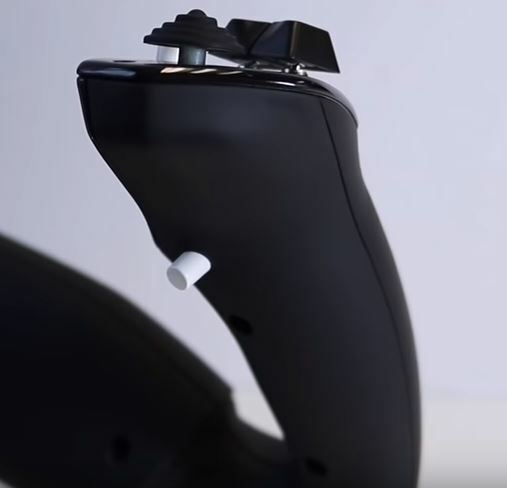 If you’re interested in obtaining that kind of adjustable design with the hardware, you have to be willing to basically double the cost of the Alpha Flight Controls. In this specific instance, it wouldn’t make much sense to have that kind of adjustability, anyway. Though it’s nice to know those options are out there for enthusiasts who want to be able to alter feedback to that level, it’s generally not necessary unless you expect your controls to be able to emulate a huge array of different types of aircraft. All Honeycomb products include a five-year warranty. Because companies tend to provide conservative estimates, it often means a warranty like this actually reflects an expected lifespan of seven or eight years. Of course, it always depends on how well you take care of the equipment. Mechanical gear with moving parts, like the Alpha Flight Controls, can be worn out by wear-and-tear. But the included user manual provides some pretty good guidelines for ensuring the longevity of the equipment. In addition to the warranty, Honeycomb has unlimited tech support. Though their informational web support isn’t anything special, their staff are actually pretty responsive. With any luck, most people shouldn’t have to end up having to interact with tech support. But it’s nice to know you’re covered if you do encounter some kind of issue you can’t immediately fix on your own. 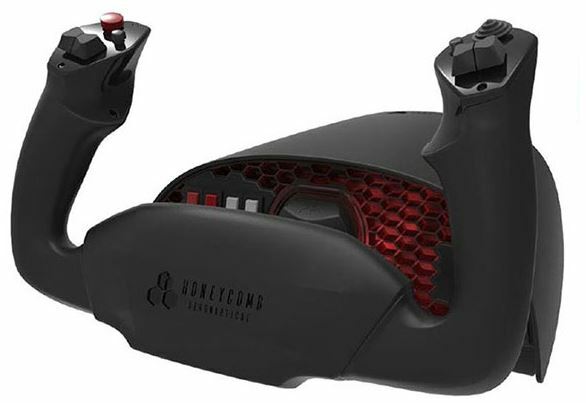 Who Should Choose Honeycomb Alpha Flight Controls? Not everybody is looking for authenticity from their flight controls. Not everybody needs authenticity from their flight controls. 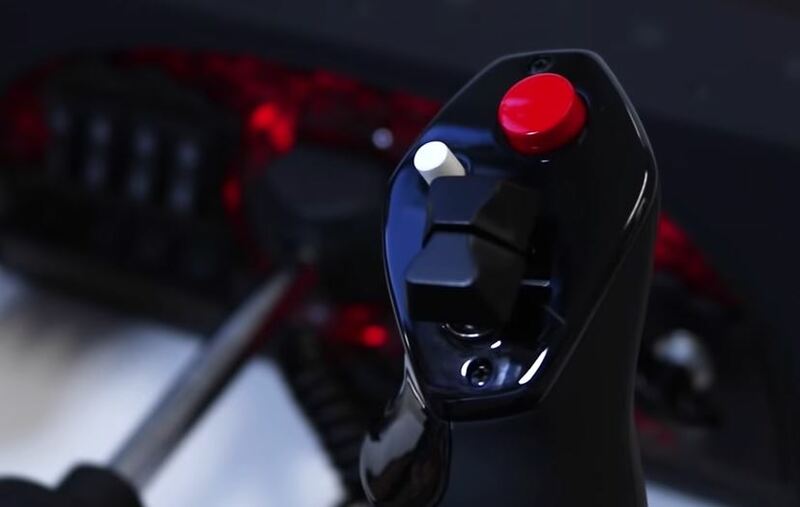 The Alpha Flight Controls deliver authenticity through their true-to-life, generally sturdy mechanical construction. In part, that’s because Honeycomb designs were developed in the USA by engineers and pilots. Honeycomb’s control software provides a setup and calibration process that’s as simple as possible. You can basically point and click your way to a totally calibrated set of controls. And with support for essentially any simulation platform you’d want to use with these controls, it’s fair to say Honeycomb’s controls have wide comparability. If you’re looking for some truly authentic flight controls, it’s tough to find most cost effective gear than this. There’s some gear out there with more control options, or different control options. But these flight controls are really a middle-point between extremes, both in terms of cost and function. And that makes them a smart choice for nearly anyone who’s looking for authenticity on a budget.